In the last five days, Earth scientists have been swarming all over the northern part of Mexico's Baja California searching for geologic clues to the largest earthquake to strike in California and its immediate vicinity in almost 20 years. 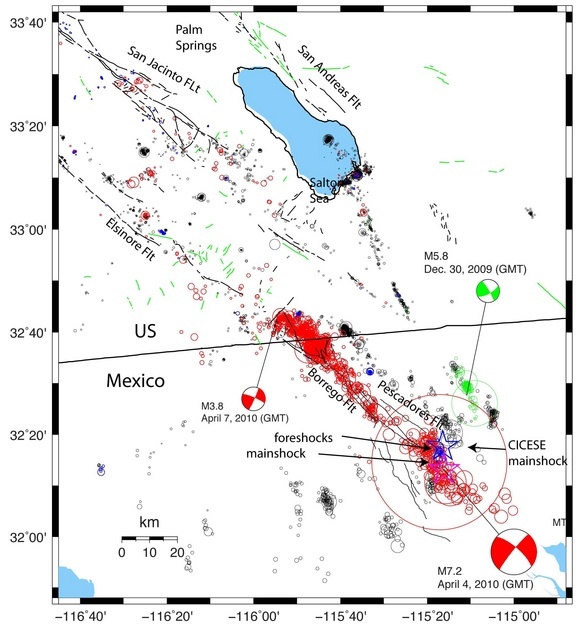 The Sierra El Mayor quake, as Sunday's 7.2 temblor has been officially named, occurred in a remote desert landscape about 30 miles south of the Mexican border town of Mexicali (see blog April 5, 2010). What have these scientists found so far? The quake's origin lay along the Laguna Salada Fault system, named after a very large, almost 40 mile long dry lakebed which lies immediately west of the fault. According to every study read by the blogger, this is a godforsaken place, more akin to Death Valley than any other location in Mexico's Sonoran Desert. The average precipitation is only one fifth of an inch per year; in the summer the mercury can rise to more than 120 degrees F and the wind can blow at hurricane strength, whipping up sand and salt particles into choking dust storms. This "Salty Lake," the translation of Laguna Salada from Spanish, is bound to the south by the Sierra El Mayor mountain range. Sunday's quake was named after these mountains, because it started adjacent to them at the southern end of the Laguna Salada fault at a depth of 11 miles. From its hypocenter, the fault system ruptured for at least 55 miles to the northwest. Geologists from the CICESE Research Institute in Ensenada (Mexico) found many places east of Laguna Salada where the earthquake ruptured the Earth's crust all the way to the surface. One of the field geologists, John Fletcher, followed these ruptures for 17 miles along a stretch parallel to the Borrego Fault, one of the subfaults of the Laguna Salada system. The maximum displacement, or offset, at these breaks was more than 8 feet - an example of the extremely strong forces which zip open the Earth along this stretch of desert. 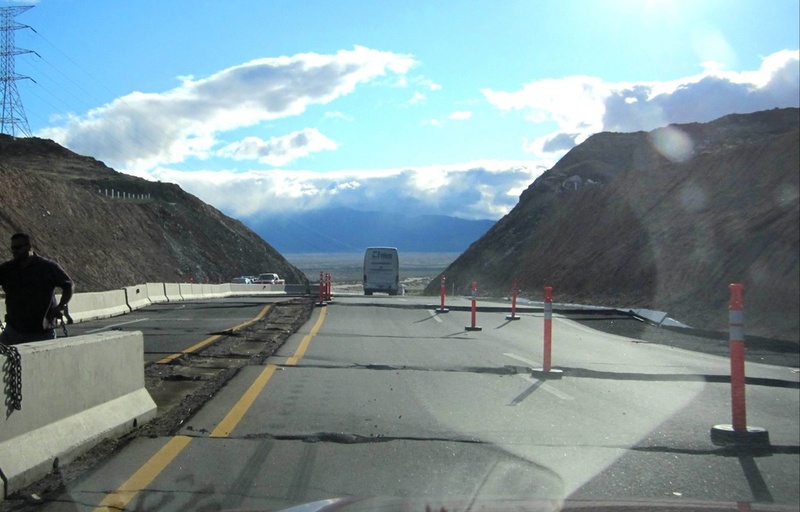 The most prominent surface faulting is seen on Mexico's Highway 2, the major "autopista" that connects Tijuana with Ciudad Juarez, the notorious city across the border from El Paso, Texas. At the north end of the Laguna Salada, where the fault crosses the highway, the earthquake has turned the roadway into a staircase. 12 distinct breaks were observed over a section of road stretching less than 15 yards, with each step about 5 inches in height (see Figure 1). The total displacement on this stretch of road alone was about 50 inches.